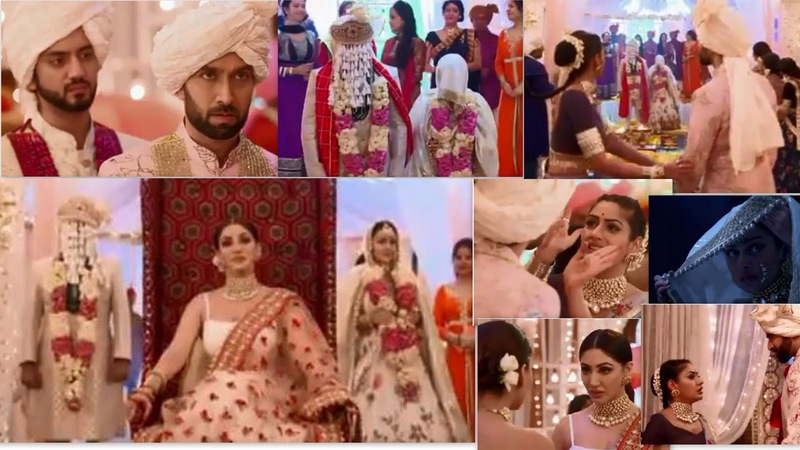 Home ishqbaaaz Ishqbaaaz 28th March 2018 Written Update Written Episode "Lights Off Marriage Happened"
Ishqbaaaz 28th March 2018 Written Update Written Episode "Lights Off Marriage Happened"
Rudra and Soumya's rituals start, Anika gets restless. Shivaay and Omkara make fun of Rudra secretly. Veer stops Anika from approaching Shivaay, he says he is sure that she is not real Anika. Veer says he since he is happy with her work, he has sent away the sharp shooter. Veer tells Anika to keep Shivaay occupied. Tia gets determined to tell Shivaay the real situation, Svetlana stops Tia and blackmails over her husband and child's life. Anika tries to talk to Shivaay, Veer intervenes, Anika covers up and tries to give hints to Shivaay. He decides to be rude with Anika to pretend in front of Veer, Anika gets worried about telling the truth to Shivaay. Anika tries to show her mehendi to Shivaay which has the message, Shivaay makes drama of seeing her Mehendi and walks away. Pandit asks to start the pheras, Omkara gets flowers to throw on the Rudra and Soumya, Shivaay says the flowers won't be enough, signals Omkara and walks away to get more. Omkara goes after Shivaay, Anika tries to show Mehendi to Anika, Shivaay refuses and walks away. Veer watches them. Suddenly lights go off. Veer goes to Soumya and checks if it is indeed Soumya. Power comes back, Veer checks Soumya's face in the mirror on the floor, Shivaay questions him, Veer covers up. Shivaay distributes flowers for pheras, Shivaay avoids Anika. Pheras start, Anika tells Shivaay to stop the wedding, Shivaay refuses. Shivaay stops Anika from stopping the wedding, Shivika argue. Anika reveals that Rudra is getting married to Soumya, Shivaay gets shocekd, Wedding gets completed. Everyone gets happy, especially Veer and Roop and Svetlana. Wedded couple takes blessings from everyone. Svetlana comes and starts clapping, Oberois get shocked. Svetlana gets Shagun from the girl's side. Svetlana says her revenge is over and reveals Tia is her sister. Svetlana curses Tia for trying to help Shivaay. Svetlana reveals that her youngest sister is now married to Rudra. Soumya reveals her face, all remain shocked. Svetlana declares her victory and defeat of Oberois. Svetlana reveals that she has already informed the media about the Rudra and Soumya's wedding. Svetlana tells Shivaay that he is lost, Anika cries bitterly and blames herself. Svetlana says since she has 50% shares of Oberoi empire, and Rudra will have 50% of remaining shares that are with Shivaay, Soumya says she will get remaining all the shares. Svetlana taunts Tej that now he is Soumya's father in law, then she taunts Gauri and tells her to be ready to turn the servant again. Svetlana says the bad phase of Oberoi family has started now. PRECAP : Shivaay asks Shwetlana What They have to do Now..She tells him Not to worry because Now You Just See the Tamasha..Shivaay Says No You Will Become Tamasha..Veer Soumya and Bua Shocked to listen this.